The Peace River is a river in the southwestern part of the Florida peninsula, in the U.S.A.. 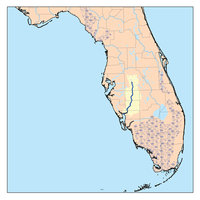 It originates at the juncture of Saddle Creek and Peace Creek northeast of Bartow in Polk County and flows south through Fort Meade (Polk County) Hardee County to Arcadia in DeSoto County and then southwest into the Charlotte Harbor estuary at Port Charlotte in Charlotte County. It is 106 miles (171 km) long and has a drainage basin of 1,367 square miles (3,540 km2). U.S. Highway 17 runs near and somewhat parallel to the river for much of its course. The river was called Rio de la Paz (River of Peace) on 16th century Spanish charts. It appeared as Peas Creek or Pease Creek on later maps. The Creek (and later, Seminole) Indians call it Talakchopcohatchee, River of Long Peas. Other cities along the Peace River include Fort Meade, Wauchula and Zolfo Springs. ^ Kevin M. McCarthy The Book Lover's Guide to Florida 1992 p304 "The Peace River begins at Lake Hamilton in Polk County and runs through Arcadia southwesterly to Charlotte Harbor. For a description of the river, read Rivers of Florida (Atlanta: Southern Press, 1974) by Henry Marks and Gene Britt Riggs ..."
O'Donnell, Brian. (1990) "Peace River," in Marth, Del and Marty Marth, eds. The Rivers of Florida. Sarasota, Florida: Pineapple Press, Inc. ISBN 0-910923-70-1.